Bellingham Florist - Rebecca's Flower Shoppe, Bellingham WA - All Occasion Flowers. The most distinctively exquisite and unique Bellingham WA flower shop. Independent Bellingham WA Florist Shop. You will be delightfully impressed with the uniquely creative blending of flowers in our florist's designs. Whether it is subtle or grand, traditional or contemporary flower designs you want, we listen to you and create the perfect floral arrangements tailored to your personal tastes. Or you can simply turn our florists loose to work their skillful and creative floral magic. 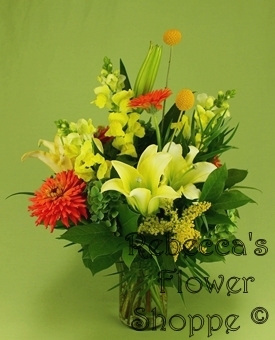 Come in to Rebecca's and find out for yourself why we are known as the finest Bellingham florist. Rebecca's is a fully independent brick and mortar Bellingham flower shop. Roses, Asters, Hydrangeas, Orchids of many types, Lilies, English Garden Flowers, and Tropical Foliage are just some of our favorite flowers and are only a small sampling of what we have for you to choose from. Contact Rebecca's Flower Shoppe and learn why we are known and respected for being the most exquisitely creative Bellingham florist shop. We also carry quite a selection of rocks, minerals, crystals, and seashells.